This week let’s start by playing a little word association game. I will put down the name of a baby registry place, and I’ll tell you what comes to mind (this is less interactive than I had hoped). 1. 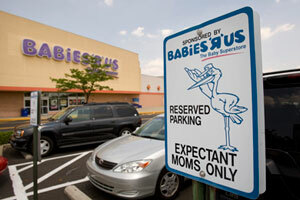 Babies’R’Us: Gimmicky–something about offering parking for pregnant people right next to the handicap spaces. I saw a man with three fingers, an eye-patch, and a wooden leg get out of the car next to Suzie Cream Cheese who was approximately 3 months 4 days and 7 hours, give or take 12 minutes, with child. She nearly dismembered his remaining leg with the auto-spring door to her BMW/Hummer/Armored Tank in that neat little spot for those poor pregnant moms-to-be. Can those expectant among us really not walk that extra 30 feet? If not, get thee to thy healthcare provider and have them check for gestational diabetes complicated by excessive laziness. 2. Buy Buy Baby: Can you actually buy the baby? That sounds illegal and illicit. I’m intrigued. 3. Target: WalMart but with less obesity and really good cheese dip. Archer Farms, you have succeeded. Although something about shopping for cheese dip in aisle 6 and then a breast pump in aisle 9 has me hesitant. 4. Amazon: Newfandangled and techie, thereby “cool”. But I think older people will get confused when they google “Amazon address” trying to go to the Amazon store and find only this. That’s quite the distance to travel to buy a SwaddleMe. 5. Pottery Barn Kids – Pastels, an alarming lack of pottery, and preppy white people. So, if you haven’t guessed it, we have been looking at baby registries. I have officially started like seven of them, immediately gotten overwhelmed, and quit. So now I get emails from each of the aforementioned places nine times daily and have taken to just not checking my email to see how many emails I can rack up before Google decides I am a robot or other form of internet safety hazard. I currently have 23,529 unread emails, no joke. I have a littttle problem with joining mailing lists–the free shipping’ll hook ya every time. I think we are going to end up registering at Babies’R’Us and Amazon. I really do loathe the baby-in-a-can feel of Babies’R’Us, but I think we need an actual store on the list. Amazon is cool and I like that we can put anything on there from any website. All I want is that Petunia Pickle Bottom diaper bag and then I can call my life complete! After deciding where we were going to register, we came to the problem of what to put on the registry. Let’s do a little math, but I’m not going to make actual calculations because that would mean getting off the couch which is not happening, so let’s say this is “Erika math”. A baby is like two cubic feet when born (sounds reasonable so far, eh?). That two cubic feet of newly formed life matter requires, according to baby-whoosie-whatsie-bloggy-bloggy-moms online, approximately 72,000 cubic feet of stuff (slightly less reasonable sounding, but go with it). That one little baby needs a crib, and diapers, and clothes, and bottles, and creams, potions, lotions, and goop. Then there’s bedding, and strollering, and bouncing contraptions that vibrate?… There are at least nine kinds of blankets these websites say I need lest I risk my baby staying warm in a blanket otherwise intended for an alternate purpose. Gasp! Is that a “receiving” blanket I see in your stroller?! And sleep sacks can’t be made from the leftover burlap Costco potato bag, I am told. So that option is gone. Also, we just learned that newborns need the equivalent of “Kitten Mittens“, which is hilarious. We now have registered for baby kitten mittens in every color. Apparently it keeps them from clawing their own eyes out, or something like that. Any advice mothers to be, mothers of old, mothers of mothers, or just people who have held two/plus babies before? (that would give you more experience with babying than myself. Double, to be precise. Again, not kidding.) If not, Kitten Mittens it is! PS. Email count at the conclusion of writing this = 23,537. Bring it on, Google.